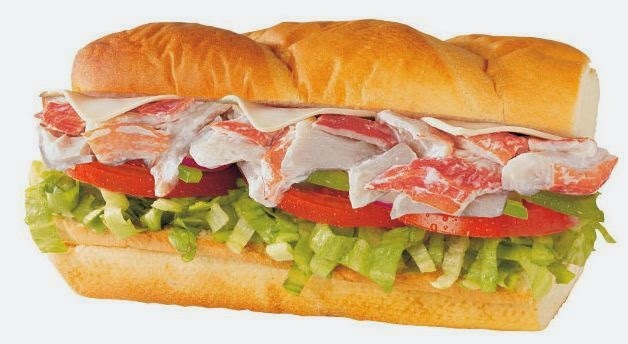 For Subway sandwiches, it makes economic sense to order Day Special instead of À la carte as it is cheaper. However, in my opinion, avoid Saturday Sub-of-the-Day for on Saturday it is Seafood and "Crab"
Looks inviting isn't it? But the above photo of Subway Seafood and Crab Sandwich is for marketing. You will not get anything like those nice big slices of crab meat. What you will get is imitation crab meat (Crab Stick) made of pulverized fish, flavoring and red coloring to make it look like crab leg meat.